QubeTown is not like other farming simulator games. There are loads of things that make it completely different, unique and better than all other farming games out there. The game has a ton of things to do, explore, and discover. It has RPG elements, fun arcade-style events, combats, exploration mechanics, and much more. To be frank, this is the best simulation game we have played. If you have just started playing it and looking for some tips & tricks, then today’s QubeTown guide and QubeTown tips, cheats & strategies will help you in progressing fast. ⇒Leveling up is one of the challenging tasks in QubeTown game as most of the features or functions are locked at the start of the game and all these functions get unlocked when the player reaches a certain level. The progress rate to the next level will reduce as you proceed further into the game. You will need thousands of EXP points to reach the next milestone level. In the early game, it would be better to focus on dragon shop orders, elephant shop orders, and planting/harvesting to get EXP points. Additionally, crafting or making items in all the shops also grant EXP to the player. For example; producing clothes in the weaver’s mil grant EXP when you harvest the clothes. ⇒Characters in the QubeTown game matters a lot. You get characters or citizens from the rescue missions or hire/buy them from the Inn facility in the town. You can assign these characters in mine to mine useful material; warehouse upgrade material, chopping items to clear the forest or send these citizens on rescue missions for EXP, characters. Additionally, production type citizens can boost the production speed, grant more EXP upon harvesting the items. ⇒The two main in-game items are gold coins and purple gems. You can use gold coins in building production type facilities in the town, houses for the citizens, constructing public buildings, hiring citizens, building labs, placing special citizens or pets(puppy, pig) in the town. These special pets or citizens provide free items to the player every hour and helping them grants EXP, gold. You can even upgrade them. You can earn gold by trading items, completing orders, helping special citizens, completing daily tasks, helping guild members, and there are many more ways. But the purple gem is the premium in-game item. You can earn it by completing all the daily bingo tasks, watching the video ads, from the events. You can use purple gems to buy more production slots in the production facilities. Keep exploring the mine to get a special reward, summon the boss. 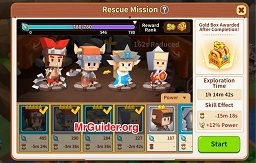 ⇒You can easily obtain a new citizen from the rescue mission. Tap the (i) symbol next to the secret mine and select the characters to rescue the citizens from the grip of monsters. The quality of the reward depends on the characters selected by you. Select the best characters and start the mission. Long press the gold chest to check the reward. ⇒The player can also hire or buy citizens in QubeTown game. Tap the Inn building next to the bridge(highlighted as Free label) -> there you can spend gold coins and purple gems for the citizens. Go to the second tab; Buy Citizens -> here you get the deals. Spend gold or purple gems for the citizens. If there is an ad offer available, accept it asap and get a free character; it could be a combat type or a production type. Most of the characters(2* or higher) have unique skills & stats. You can improve these attributes by enhancing. Tap the training camp building in the town(near INN) -> here you can check all the characters you have collected so far -> select a character -> enhance -> select the characters you want to sacrifice to level up the target character. It will cost you gold coins. If you have loads of 1* or 2* characters, you can combine them to get a high-grade character. Go to the training camp building -> combine -> select three heroes of the same grade -> confirm. You will get a random character and all the citizens used in the combining process will disappear. So this would be all for now as QubeTown guide. Obviously, there are loads of things this article does not cover. You can simply ask in the comment section if you need any help. Let’s have a look at our top QubeTown cheats, tips & strategies! In some facilities such as bakery, dairy farm, bbq house, sugar factory, boutique, weaver mil, and more, you can assign the managers. The game gives you a free character Cogg in the tutorial. But that manager does not have any ability. But you can acquire new managers or citizens from the rescue missions or Inn. If you have the citizens who can work in these production centers, make sure to assign them as a manager. Go to the training camp -> produce -> there you can see the managers. Tap on any citizen to check its skill and production building. Assign him/her to that production building to get the advantage of his/her skill. For example; boost in the production, boost in the EXP reward, and reduction in the production time. To assign, tap the facility -> at the bottom-left corner, tap the Cogg or empty slot and assign the best manager. As you upgrade the castle, new special citizens or animals will get unlocked. You can place them in the town and get a specific item every certain hour(S). For example; Lucky, the puppy provides milk bottles every 6 hours. Additionally, helping these special citizens or animals grant EXP, gold, hearts. Collect hearts to upgrade these special citizens, pets. In QubeTown game, you play as a lord. You can customize the lord with a variety of outfits available in the shop. Most of these outfits provide a special reward to the player after every certain hour(S). Tap the outfit button near the mail icon on the top-right side -> tap the arrow button to visit the shop -> here you can buy outfits for the lord. When you buy an outfit, you get an item called Topaz. Use topaz to buy special items in the shop. In the early game, we would not recommend you to spend gold on these outfits. At the top-left corner, tap the calendar type icon -> here you can check the daily quests. Complete all these daily quests to earn purple gems, loads of gold coins. QubeTown also features a guild system. The game will prompt you to join a guild when you unlock this feature. You can help team members by giving them the items they need. In return, you will earn EXP, gold. Additionally, you can request items using the guild trade feature. Participate in guild events for more rewards. QubeTown game also features a tournament system in which the player competes against each other for the rank and better rewards. As an example; at the time of writing this post, there is an event available; Lord Runner. In this tournament, you play as a lord, dodge the obstacles, and run a long distance. To participate in the tournament, you need tickets. You can make these tickets using items; bread, milk, bacon, and more. When the event starts, the game will show you the two facilities. In one of these facilities, you can make the ticket. Or tap the event icon at the bottom-right corner -> there you will see the two facilities. You will often see the chests or other items floating in the river. Tap these items to earn EXP. At the top-right corner, tap the mail icon -> In the reward tab, you get the ad offer; watch the video ad to earn purple gems. Make sure to add friends in the game and send them gifts daily to earn friendship points. You can use these friendship points to spin the roulette wheel. You could get free purple gems, gold, and many more items. So these are the top QubeTown tips for the beginners. If you have more tips & tricks to share with other fellow players, comment below!